Dos Pueblos High softball pitcher Hannah Harris retired the side in the second inning, and the loudspeakers played “Another One Bites the Dust.” Little did the Chargers’ fans know that it would be their undoing when the Buena Bulldogs “bit the dust” at the corners of the infield, helping the visitors take a 2-0 victory in their first Channel League showdown of the season at the DP diamond last Friday. Kai Uyesaka of the Chargers was twice robbed of extra-base hits. She hit a smash down the third-base line that Buena’s Maddie Foulks smothered and fell on the bag for a force-out to end the second inning. In the sixth, Uyesaka hit a rocket toward right field, but Buena first baseman Rieanne Thomas made a diving catch that left her covered with infield dirt. “I play soccer goalie, and I’m used to reacting,” Thomas said. Two banners attached to the backstop proclaim the CIF softball championships that Dos Pueblos has won — in 2005 and 2011. The Chargers caught fire last year after a 7-5 loss to Buena late in the regular season. They won seven consecutive games, including five in the CIF playoffs, capped by a 5-0 victory over Kaiser for the pennant. 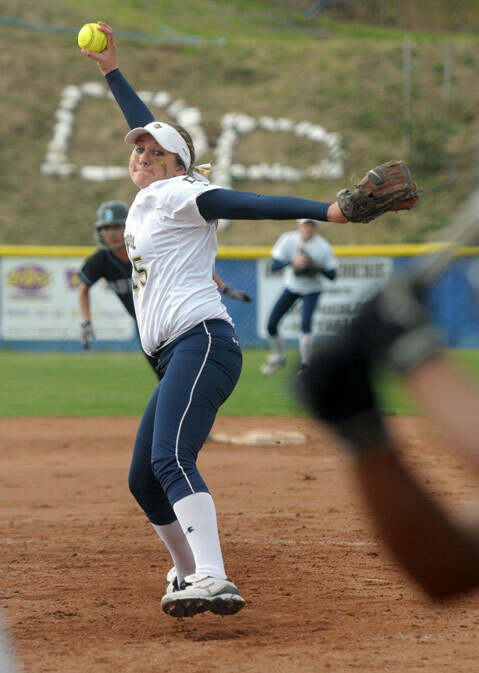 Hannah Harris, then a junior, did all the pitching for the Chargers and allowed just one run in 39 playoff innings. She was named the Division 4 Player of the Year. Fresno State has proffered her a scholarship for next year. Harris is one of four starters returning from the championship team. This year’s squad already has claimed a high honor — the large-school CIF Southern Section academic title for softball. Agnetta Cleland, a junior, is one of the starters and academic standouts, but she missed last Friday’s game because she was competing with the DP team at the California Mock Trials in Sacramento. They finished second in the state. TRAGIC LOSS: Dos Pueblos seems to turn out successful student athletes in cookie-cutter fashion. But all are unique individuals. One of the most compelling was Samantha “Sam” Wopat, who shared the school’s “Top Female Athlete” award with her twin sister, Carly, when they graduated in 2010. They balanced each other’s personalities, Carly being described as “laid-back” and Sam as “more stubborn” during an interview at the DP gym. Tragically, the sister act was shattered last Sunday when Sam Wopat, 19, died at Stanford Hospital. 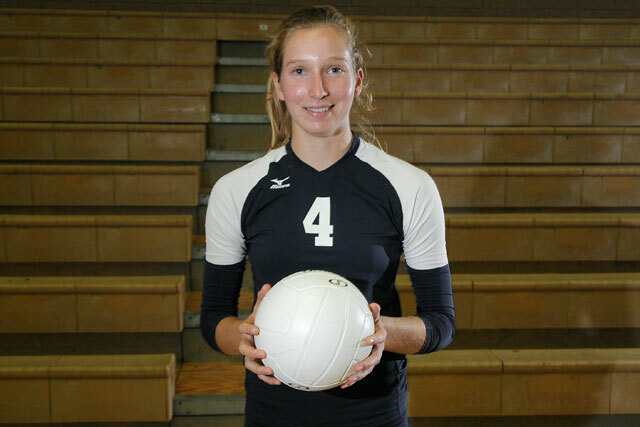 Her family, friends, and acquaintances at both Dos Pueblos and Stanford University, where the Wopats continued their volleyball careers, are in mourning. OLYMPIC ACTION: Two serious contenders for 2012 Olympic gold are the men’s water polo teams of Italy and the United States, which is coached by Santa Barbara native Terry Schroeder. They will play an exhibition game Thursday, March 29, at 7 p.m. at the Dos Pueblos High pool. The admission prices ($25 for adults and $20 for students) may seem steep, but consider the cost of going to see them in London this summer. … You can see some of the world’s top all-around track-and-field athletes for free at Westmont College on Monday and Tuesday, April 2-3. Among them are Ashton Eaton, the silver medalist in the decathlon at last year’s World Championships, and Sharon Day, the national champion in the heptathlon. They will be working on various events at the Sam Adams Combined Events Invitational, beginning at noon each day. Sam Adams was a Hall of Fame UCSB track coach who died in 2010. A poignant note: Sam Wopat was named after Adams, who coached her father, Ron Wopat, in the decathlon.